Answer: Can I recycle a milk carton in Palo Alto, CA? Here's what I found. In this small study, 215 people answered the question, each giving a URL that shows the answer to the question. But get this, 49.82% of the respondents said "No" to the question (and so 50.17% said "Yes"). That's a more even split than you'd get if you flipped a coin 215 times! What I think this shows is that even simple problems can sometimes be very hard. A couple of things happened here. 1. The question is ambiguous. Only a few people (10 out of 215) pointed out that the question is ambiguous--I never really specified what kind of milk carton. There are at least 3 different kinds of milk containers popular in California these days. There's the aseptic container (AKA "shelf-stable" like a juice box, made up of layers of aluminized foil, plastic and paper), and there's what we think of as waxed paper (but which is REALLY made of paper + plastic layers, no wax is involved). Then there are also plastic jugs and glass bottles (and, for completeness, tins of condensed milk). You know those can be recycled. But let's carry on and try to find a place that will recycle both kinds (refrigerated and shelf-stable). 2. People found out of date content. This happened in one of two ways... First, there ARE web pages out there that are just old. When you're looking for content that might change (due to changing recycling policies or city government or... whatever), be SURE the content you're looking at is relatively recent. (Some of the answers people gave cited web pages from 4 years ago. then this was probably the 4th result on the SERP. You could argue that Google should give you only latest / greatest information. But information providers (in this case, a local newspaper) wants to keep their old articles around as well. There's even a way they can markup the information as being "out of date," but that doesn't always happen. But notice the publication date just below the green URL. It says "July 25, 2009." The Recycling Drop-Off Center has closed since then. A. Look for variances of opinion. Sure, finding contradictory answers is a pain--we all want our results to be straightforward and simple. But the world is often not agreeable, it comes in shades and a multiplicity of views. Some guides (e.g., the City of Palo Alto Garbage and Recycling Fact Sheet or the What Goes Where Guide) will say "No," while other, equally official guides, (e.g., City of Palo Alto Curbside Recycling: What goes where?) will say "Yes." Important point: When you're finding multiple different answers, pay attention. It's turning into something tricky and interesting. B. Be sure your information is up-to-date. Check the publication dates and be sure it's relatively recent. What's more, be sure that information that changes rapidly (e.g., "Who is the mayor of the city?" "What is the exchange rate for the Euro?") has been very recently updated. A few people found web pages such as this one: http://archives.cityofpaloalto.org The "archives" in the URL s a bit tip-off that the information is probably out-of-date. Read the URL! What this means is: Check your dates. The city has two pages with opposite answers. But one has a date of Nov 13, 2013, while the other is a month earlier (Oct 2, 2013). I'm going to go with the most recent date... and that says you CAN recycle milk cartons. Go ahead. Put it into the recycling bin. It's completely fine. Wednesday Search Challenge (1/29/14): Can I recycle a milk carton in Palo Alto, CA? Today's search challenge shouldn't take long. In fact, today's challenge is to find the answer and fill out the form in just a few minutes. Background: As you know, every so often I do small tests to see how well people can search for this-or-that. This is one of my classic questions that I use for calibration purposes. I'll explain why on Friday (and share the results with you). In the meantime, if you want to add a comment below, that would be great. Let us know how it went for you! 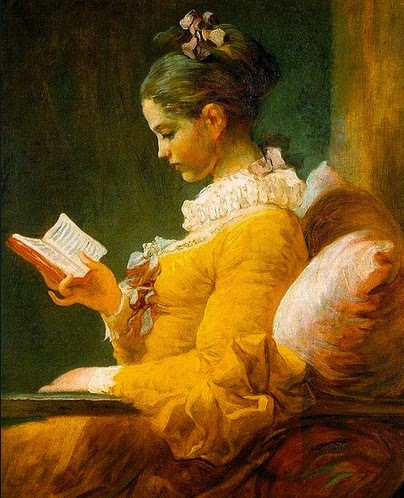 Essay on literacy: What should writers expect from readers? What do I expect from you, dear reader? More importantly, what does any author expect of their readers? Do I expect that you’ll skim over the text and smile quietly, or do I expect you to wrestle and engage with it, mano-a-mano? As you read, you might have had a momentary mild surprise, but then keep on reading. Since you know me and have read things like this before, you’d probably assume that it's not a typo, and I had something slightly odd in mind. But unless you’re a dedicated reader and burdened with an endlessly inquiring mind, you probably won't look it up. Why not? In an online world, where many things are quickly searchable, why not? What does this say about the nature of reading? I’m not sure how other writers do this, but we are always standing balanced on the knife edge of decision. Shift the salami of choice one way, and the edge cuts fine and the word works in the text; shift it the other, and the wounded word drops to the floor, un-understood and point missed. This is true at the microscopic level (word by word, slice-by-slice), and at the macroscopic level (story thread by story thread, or salami-by-salami). One of the joys of reading is seeing the way some writers play with language. I completely enjoy reading books by Barry Lopez, almost always learning something new about the world, and about language at the same time. In his essay “Effleurage: The Stroke of Fire” you learn a new word right off the bat: Effleurage is a massage done with a circular stroking movement. What’s fascinating about this use of the word is that he’s describing the way a traditional potter’s use of a long, “dragon-shaped” wood-burning kiln to fire his pots. That’s about as far away from the ordinary meaning of effleurage as you can get which normally has a connotation of delicacy. But once you know that word, the essay sparks with a kind of brilliant glimmer of insight. The potter IS massaging the kiln’s fire, moving it up and back and around in the dragon’s belly; the idea is similar, but logically distant, and very, very precise. By the time you visually zipline over the 22 characters of the Hawaiian name, you know that humuhumunukunukuapua'a is a fish and the 3 character o’o is a bird, all nicely self-contained. As a writer, you expect certain things from your readers. If you’re writing a Russian novel, readers expect interesting Slavic names. 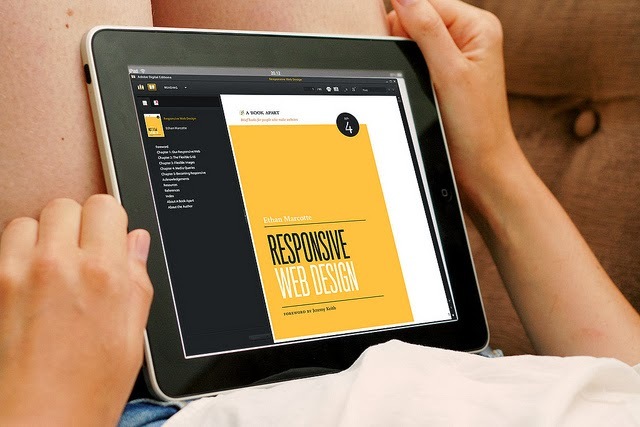 If you’re crafting technical documentation, you write with the expectation that the reader wants to get through your sterling prose as quickly and painlessly as possible. Naturally, the most important thing you can have in mind while writing is an image of what your readers understand and what they’ll do in response to what you write. It boils done to choices like this: Can I use a word like effleurage? Will readers understand what I mean? Will they bother to go look it up? What about words like quark, reification, dendrochronology, or metasequoia? What about concepts such as Stirling engine, dark energy, or the Hanseatic League? It’s magazines all the way down. What I mean is that if you’re a “Gourmet” magazine type reader, I can use vocabulary like emulsify, lecithin, and molecular gastronomy with impunity. If you’re a “National Geographic” reader, I know I’m safe with places like Tierra del Fuego, and Alice Springs, or concepts like “walking a transect” or “karst topography.” A “Reader’s Digest” reader implies a certain level of simplicity in writing, while “National Review” implies another. Even conceptual fields that are far flung can be useful to think about. Someone who scans “Cigar Aficionado” will know that sometimes a Cohiba is just a Cohiba, while a “Scientific American” readers will probably understand the difference between “dark matter” and “dark energy” and if they don’t they’ll look it up. But they also might not know the difference between Bob Marley and Bob Crachit, or care. So the REAL question is not just what kind of magazine audience do you write for, but also what do you expect the reading audience to do with what you write? Will they look up a concept or word and reach for the deeper meanings? Will they bother to check out the reference I’ve made to an essay or book? I’ve found that my reading style has shifted as I move into more electronic forms. Now, every time I see a word I don’t know, if I’m on a tablet, I long-press it to get the definition. This has changed the way I read; it has changed the level of understanding I have. I do more-or-less the same thing when reading an essay on my laptop. The mention of the name of an interesting essay (say, “Effleurage: The Stroke of Fire”) causes me to copy/paste it into Google and see from whence it came. Note that I gave you the link in the mention above. Should I do that, or should I expect that you can do it on your own? Another example: I, the writer, expect you to be able to recognize quotes. And I guess I expect you to look up stuff that doesn’t make sense. I expect you can find a reference even if I just sort of graze up against the idea or borrow a bit of language. Does this cause me to write differently? It certainly does. I have more expectations of you because you, gentle reader, are a creature of the present, and reading now is different than it was 50 years ago. I expect more of my readers. Turns out that it just means “vast,” after all. BUT… it evokes a particular sense of time and place and kind of purposefully overwritten meaning. “Vasty” was introduced in 1596 by Shakespeare in Henry IV, Part 1, so it’s been around for a while. It appears when Hotspur mocks Glendower for his outrageous claims that he can control the devil and spirits. That’s it—the original coinage of the term. But you knew that. I know some fraction of you looked it up. Other writers have picked up the word and used it in their own writings, but always in a passing homage to Shakespeare. And that’s how I’m using it, as a bit of spice to the story. And for people who remember where “vasty” comes from, it adds a twist of zest, a kind of seasoning for the mind. In this case, I’m using it as a foil, but a fun foil that makes my point. It’s all just words, but this one is very New Yorker and Paris Review. As are you—which is what I would have expected. Have you looked up humuhumunukunukuapua'a yet? It’s well worth the cut-and-paste. Such a long word, but such a brilliant fish. How National Geographic of you! And how our expectations about literate reading have shifted. Keep reading. But read differently. I swear I didn't know this was going to happen. But in yesterday's (1/26/14) San Jose Mercury News, the front page article was all about Megadroughts. The article, California drought: Past dry periods have lasted more than 200 years, scientists say (Paul Rogers, staff writer for the Mercury) echoes almost exactly what we found in our SearchResearch challenge. Interestingly, they show a slightly different version of the drought chart we found. Here, I've linked to their chart, which is based on work by E. R. Cook, et al., in Earth-Science Reviews. Cook, Edward R., et al. "North American drought: reconstructions, causes, and consequences." Earth-Science Reviews 81.1 (2007): 93-134. After mentioning the "About this site" feature last week, I thought I'd just go ahead and make a 1MM video demonstrating its use. Here you go: 1 minute of demo. The best way to watch this is to expand to full-screen. It's a much nicer video experience. As I mentioned, the "About this site" information is pulled from the Knowledge Graph. As you'll see, most of the citations are to Wikipedia, but this will change over time as more knowledge sources are being used to drive the creation of information in the KG. Answer: How common are droughts in California? Clearly, my Fridays are too full with other work-that-needs-doing. I'm still learning how to write the answer AND get it pushed out by Friday. Insight: I need to still write it on Thursday morning, just as I've been doing for a while. Next week I''ll try to get it right! But I'm going to resist, and just try to focus on how one would search to answer this question. 1. Can you find a record of the rainfall in California for the past two thousand years? And what does that tell us about the relative frequency of drought? In other words, if you CAN find some way to track that rain back into deep history, how often do droughts take place? And how long do they last? In particular, should we really be worried? Is this just a temporary thing that will be gone soon? Or is this a vision of a future to come? I like this as a research question because it's typical of the way many research questions are asked--there a lot of specific details. The phrases "past two thousand years" and "rainfall in California" and "relative frequency of drought" all act to pin down the kind of results we seek. One thing to be cautious of: Don't let the specifics trap you into using exactly that language. Sometimes that can be over-specific and get you stuck. My first thought was "how do you even measure rainfall (or lack of it) over two thousand years?" I also found a few sites that looked pretty interesting, and just as important, believable. These tended to be the sites that conducted the original research (usually government, university or academic publications), as opposed to sites that merely compile the data for the purposes of giving it their own (often politically based) interpretation. After spending a bit of time immersed in the background literature, learning some of the ideas and picking up the language, I was ready to do my actual search! Knowing now that there are trees in California that span several thousand years (both the redwoods, Sequoia species, and the Bristlecone pine, Pinus longaeva), I thought I'd start with dendrochronology as my first attempt to find 2,000 years worth of rainfall data. This was a very productive search. If you ever want to learn about dendrochronology, let me point you to the University of Tennessee dendro site. Aside from being a fascinating repository of all things dendrochronological, it also gave me a name of a researcher--Henri D. Grissino-Mayer--that would be useful later. Opening articles side-by-side: When I find a rich set of links like this, I CMD-click to open several pages in new tabs. (For PCs I think it's a control-click.) This lets me see many results side-by-side in different tabs without losing the original SERP that was so useful. CMD-click. CMD-click. CMD-click. 3 new tabs are open. I quickly look through them to see ones that look plausibly good for more information. In effect, I'm skimming through a lot of material rapidly. Interestingly, one of the links was a newspaper article in the LA Times. Reading that gave me another name and a clue. It mentioned "..paleoclimatologist Connie Woodhouse, a co-author of the study that will be published in the journal Geophysical Research Letters." Keeping notes: What I'm doing is learning as I go--picking up (and often writing-down) the names of authors, researchers, titles of papers, and labs where good work is going on. This often proves useful when I'm trying to expand my search. Uh oh. This is getting interesting, and slightly scary. Here's another reference by the same author that I picked up from Google Scholar. Woodhouse, Connie A., et al. "A 1,200-year perspective of 21st century drought in southwestern North America." Proceedings of the National Academy of Sciences 107.50 (2010): 21283-21288. All of these papers are coming from incredibly reputable sources. The National Academy of Sciences is an incredibly prestigious non-profit organization that serves pro bono as "advisers to the nation on science, engineering, and medicine." They regularly issue very authoritative reports on a variety of topics, including paleoclimate. I also find an article by Grissino-Mayer (another name I recognize!) on a reconstruction of a 2,129-year dendrochronology for New Mexico. I'm getting close! So these documents are out there, just waiting for me to find them. Stine, Scott. "Extreme and persistent drought in California and Patagonia during mediaeval time." Nature 369.6481 (1994): 546-549. In this article he tell us that two major droughts happened in 892 - 1112 (220 years) and 1209 - 1350 (141 years). This was at the same time as the "Medieval Climatic Disruption" that was affecting climate around the world. It was a dry few centuries in California. When I repeat this same search in Google Books, I find this fascinating text. The West Without Water: What Past Floods, Droughts, and Other Climatic Clues Tell Us about Tomorrow. University of California Pr, 2013. Ingram, B. Lynn, and Frances Malamud-Roam. Focusing your search by following an author: As I read through much of this book (in Google Books), it seemed to be incredibly close to what I was seeking, so I thought I'd follow up on the work of some of the authors. I started with Lynn Ingram (at UC Berkeley Geography Department), and in the process, I discovered a gold mine of her work. (1) What was the natural variability of annual average inflow into the San Francisco Bay estuarine system during the Holocene and the last interglacial? (2) What was the amplitude and seasonal distribution of inflow during this period? (3) How did changes in inflow and sea level rise affect the ecosystems of the northern reach of the estuary? 4) What are the implications for future climate change and sea level rise for the San Francisco Bay system and other urban estuaries? (5) How has upwelling along California coast varied over the past several thousand years? This is a great lead. Her research questions are exactly what I was looking for. I went to Google Scholar (knowing that she's probably going to publish in academic journals) and ran a search just on her name. to find papers she's written on the topic. Bingo! 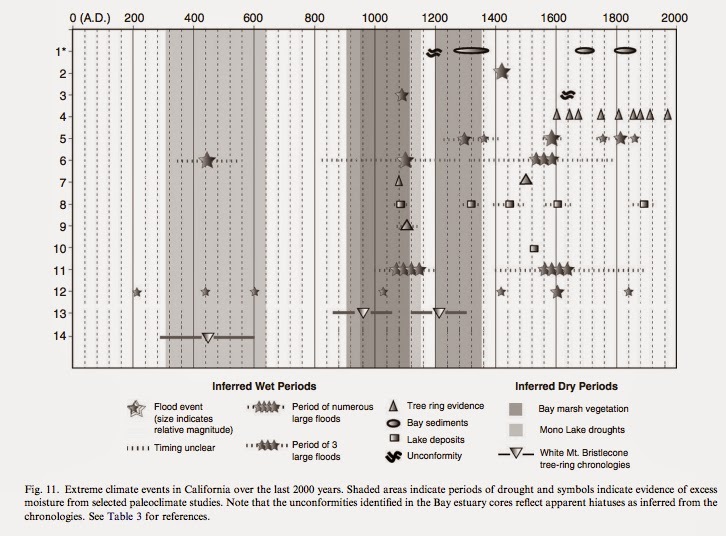 This is one of the key diagrams from: "Holocene paleoclimate records from a large California estuarine system and its watershed region: linking watershed climate and bay conditions" Quaternary Science Reviews 25 (2006) 1570–1598). Frances P. Malamud-Roama, B. Lynn Ingram, Malcolm Hughes, Joan L. Florsheim. "Climate over California during the last century has been relatively stable when examined in the context of the past 2000 years, even with the severe droughts of the, 1930s and the mid-1970s. ... Longer term records, including tree rings, and sediments from lakes and from in and around the San Francisco Bay, provide a means of extending records to cover paleoclimate for much of the Holocene. When these longer paleoclimate records are considered, current drought conditions experienced in the US Southwest do not appear out of the range of natural variability." Malamud-Roam, F. et al. "Holocene climates and connections between the San Francisco Bay estuary and its watershed: a review." San Francisco Estuary and Watershed Science 5.1 (2007). pushes back their analyses of rainfall, drought, and other climate variables back to 13,000 years ago. To get that far back in time they use a variety of data sources (tree rings only get you 5000 years back), but the story is pretty consistently the same: droughts happen fairly frequently; sometimes they're very, very long. "If you go back thousands of years, you see that droughts can go on for years if not decades, and there were some dry periods that lasted over a century, like during the Medieval period and the middle Holocene. The 20th century was unusually mild here, in the sense that the droughts weren’t as severe as in the past. It was a wetter century, and a lot of our development [ in California and the West ] has been based on that." Search lessons: There are many lessons to draw from this example. 1. What's authoritative? We looked at a large number of articles, trying to stick to well-known sites that I considered authoritative. How do you know what's reliable? Good question. The answer is tricky, but it's basically a reputation question that comes from your belief system. For instance, in searching for articles on this topic, I stayed away from "climate change skeptic" sites. (There are a lot out there.) Their data could be fine, particularly about paleoclimate, but I've found that they tend to cherrypick the data they present. I tend to trust articles (and authors) where the data isn't quite so black-and-white. Deciphering the past is a tricky business. In many of the papers I cite above, you'll see contradictory evidence ("this site indicates these years were in drought, but this other site seems to be well-watered..."). That lets me know they're not out to sell you something, but are genuinely trying to present data for evaluation. Ambiguity isn't always a problem, sometimes it means the answer just isn't that simple. 2. Learn the terminology. As you see in my very first step, often the best first thing to do is to look around a bit and learn what the key terms are. This is always the first thing I do when starting a research in a new (to me) area. What special words and phrases do I need to know? Who are the big players in the field? What institutions participate in this kind of work? And very importantly: What common terms do I need to learn have special meanings in this area? It's just as important to learn that some ordinary words (such as "drought") have very specific meanings in this area. To avoid misunderstandings, be sure to notice how writers use everyday words in special, sometimes subtle ways. 3. Follow an author. As I mentioned, as I research, I keep notes. I take names. I write down institutions, places, and temporary results. I write down fragments of things found along the way that might help to find the next bit. Keeping notes of authors is really useful. Then, once you find an author that has an interest along the lines of your research, check out their publications. This is especially true for academic writers, but this also works well for news reporters, essayists, and book authors as well. 4. Use Scholar and Books for their intended purposes. I can't tell you how often I would find a paper, then zip over to Scholar to find the citation of that paper AND find a PDF. Same thing with Books--I'd find a book reference, then use Google Books to (usually) search inside of the book for more information. Both of these are special purpose tools, well worth understanding for what they are. Thanks to all of the SearchResearch commenters! You make reading the blog a real search joy! Answer: What's up with her fingers? Answer: What's missing from the sphinx? Answer: Did everyone like the lights?